The Act of Union in 1800 followed a turbulent twenty year period when the influence of the American Declaration of Independence and then the French Revolution had engendered much debate and culminated in open rebellion in other parts of Ireland. The Irish Parliament was dissolved, and as a result the borough of Strabane no longer had a dedicated member of Parliament. This made the work of the Corporation more important in the life of the town. 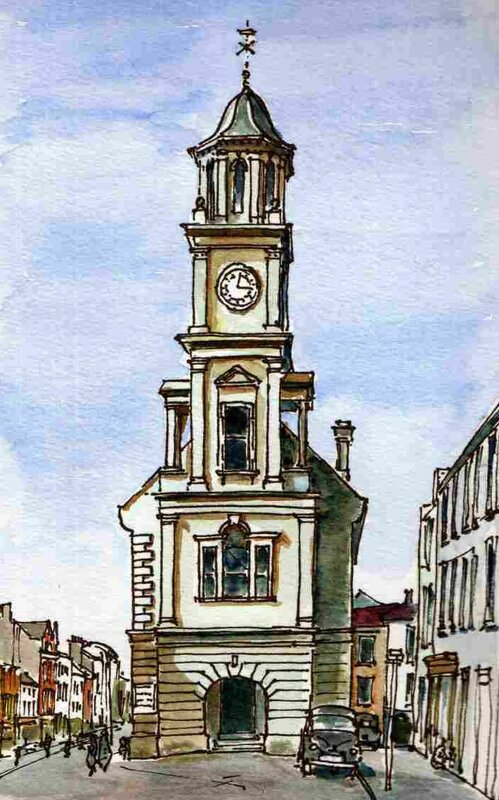 They met in the town hall, located at the junction of Market Street and Main Street -a building which was being rebuilt in 1766. This view shows the fantastic steeple added in a renovation of 1904. Unfortunately the building was bombed in 1972 and subsequently demolished. The Farmer’s Home on Railway Street is indicated on the 1833 Ordnance Survey map, the first detailed map of the town. However it is likely that the building we see today was remodelled in the 1860’s. The giveaway is the single pane sash windows on the upper floors made possible because of advances in glass technology mid-century. The influence of Georgian simplicity and proportion continues however. The building is of a type once very common but now increasingly rare. Now used as council offices, this is the front block of the Strabane Union Workhouse. Built in Tudor Gothic, a style often used for Alms houses, they were built across Ireland to a standard plan in the 1840’s. Designed to be refuges of last resort, they had a deliberately harsh regime with families split into different wings on entering. In folk memory they are associated with the Famine of 1845-1848. 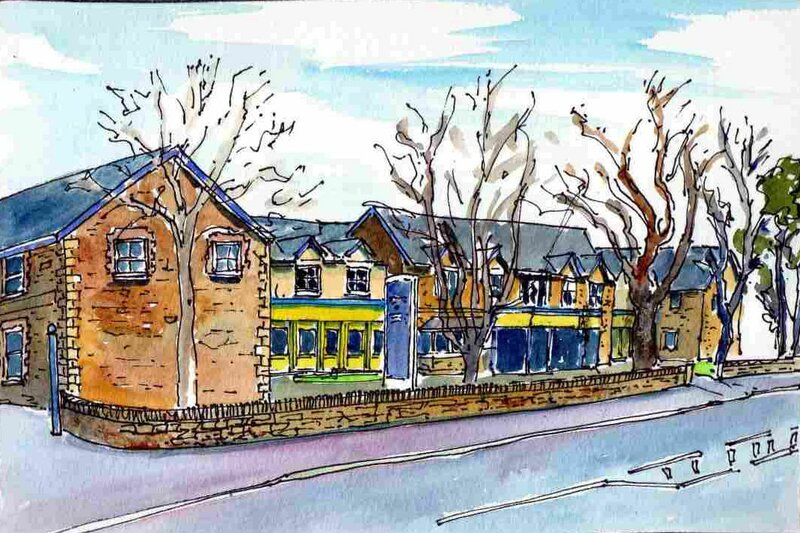 Though the worst of the effects took place in the rural area,in Strabane an extra fever ward was built to accommodate 70 people on the hill behind the building and a house was hired to accommodate a further 36 inmates. The population of the town dropped from 7,000 before the Famine to 4,000 in 1889. 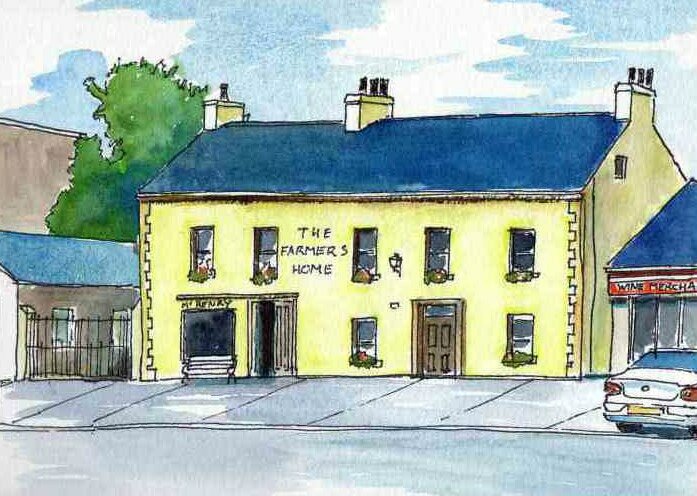 Farmer's Home Public House, Strabane.